MakaiLay Seismic can greatly improve the accuracy in which arrays are laid on the seafloor. MakaiLay Seismic is an extension of the successful cable installation software, MakaiLay, developed by Makai Ocean Engineering and currently used by over 80% of the deep water cable installers in the world to accurately lay military arrays, telecommunication and power cables with a high degree of placement and slack/tension accuracy. MakaiLay Seismic runs on a PC under Windows XP/7/8 operating systems. MakaiLay Seismic has been specifically designed to address the new challenge faced by the seismic industry to accurately install and retrieve Ocean Bottom Cables (OBC) in mid- and deep waters. In addition to the large number of features already existing in MakaiLay (see Makai’s brochure on MakaiLay for details), the MakaiLay Seismic software provides the following capabilities for the cable installation and retrieval process. 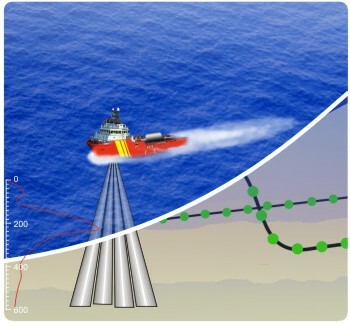 New design tools are provided to the operator to efficiently prepare the assembly of the seismic arrays, including the location for each in-line geophone and transponder along the cable and the laydown routes along the seabed. The planning is done in a Geographic Information System (GIS) environment to allow the user to precisely place their arrays relative to each other, shorelines, bathymetry, other cables, etc. The software can import and properly translate data from other GIS databases in a variety of formats, projections and datums (over 150 different formats are supported). MakaiLay Seismic can be used to generate Ship Plans or train operators in the office prior to live at-sea installations. Installation planning is achieved by running computer simulated cable lays in the office to dynamically model the cable, equipment, procedures and environment of the actual lay. Such simulations allows for detailed analysis/selection of the equipment, techniques and data inputs required to safely and reliably lay the cable along the planned route. The system can simulate real world problems such as ship navigation errors, variations in ship and cable payout speed, unobserved changes in ocean currents and bathymetry. This capability allows users to answer important questions before going to sea, such as: Is a dynamic positioning system required on the vessel? Is it necessary to measure currents to achieve the desired placement accuracy? Do we need to attach transponders on the cable and how often? How much does the installation speed affect the placement accuracy of the sensors? In addition, the system has proven to be an excellent training tool, and it provides operators with as much experience as possible under different deployment scenarios before the real lay. The cable lay simulations allow the operator to become familiar with how the cable behaves (e.g., response times and cable shapes) under different environmental conditions and help him to develop a clear understanding of efficient techniques for sensor placement/retrieval and bottom tension/slack control. In addition, the operator can be trained in dealing with contingency situations. For example, under a sudden cable halt in payout, what should the vessel do to prevent undesirable bottom cable motion and tension? 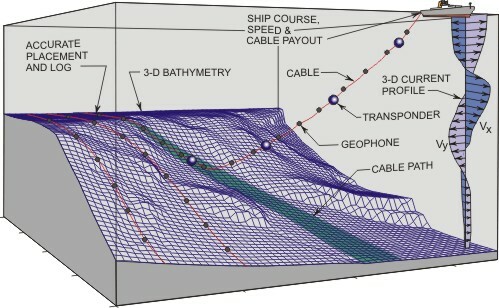 The 3D cable model has been rigorously tested and calibrated at-sea, and as a result, the cable touchdown conditions location, slack, tension and even bottom dragging are confidently computed. 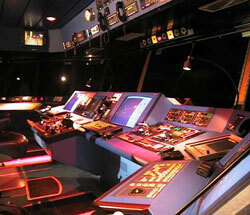 MakaiLay control station onboard an installation vessel. MakaiLay Seismic can guide the ship along the Ship Plan by working directly with a DP system or by displaying guidance to the helmsman. The navigation display provides ship guidance information and optionally shows any or all other related information in a GIS environment. Dynamic 3D cable model used by the control system. The heart of MakaiLay Seismic is a detailed and rigorous 3-D dynamic model of the cable. The model accurately computes the geometry and forces acting on the suspended cable, and the cable touchdown position and bottom tension (or slack). This is accomplished by taking into account cable characteristics (size/weight), ship velocity, bathymetry, currents, feedback from transponders attached along the cable and all other parameters affecting the dynamic position and accuracy of the cable lay. With such knowledge available at all times, immediate and accurate cable lay forecasts and command decisions can be made that account for any complex real-world situation, both planned and unplanned. The software changes the focus of cable deployment control from the cable condition as it leaves the vessel (current practice for OBC) to its condition on the seafloor. It allows cable installers to focus on the most important issue in any cable lay: the installed condition of the sensors on the seafloor. 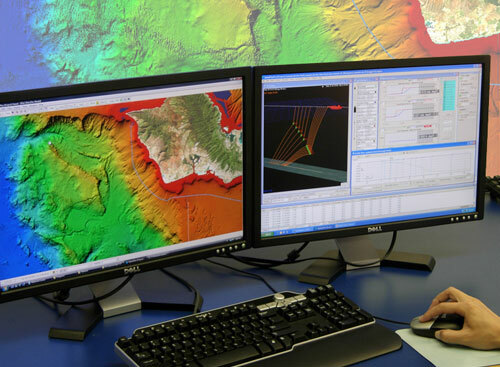 The sophisticated computer model monitors in near real-time the cable bottom conditions in the recent past and can predict the results of future cable and ship actions on cable seafloor conditions. Ouputs are presented to the user in tabular and graphical form. The result is a major improvement in the installer’s knowledge of the cable condition on the seafloor and in his ability to predict and control touchdown conditions. Kalman Filter incorporates transponder positional data in the cable model solution. As explained above, the control system itself is based on rigorous cable physics, and its accuracy has been validated multiple times in the past. Accuracy is, however, limited by the quality of the input data, in particular the measurements of cable length paid out and ocean currents. Having accurate position measurements of transponders attached to the cable can compensate for some of these input errors and can be used to significantly improve the overall cable and sensor placement accuracy. This is of particular importance for OBC installations where transponders are placed at regular intervals along the arrays. If highly accurate transponder data is available (RMS position error = 0.25% slant range), the control system has the option to directly force the mathematical solution of cable shape to pass through the bottom most transponder position available on the suspended portion of the cable. Since the position of this transponder is known, the bottom transponder effectively acts as a “ship” closer to the bottom, which in turn improves the accuracy of the touchdown location. If the position information provided by the transponder is not as accurate as desired, the software can still use the positions of multiple transponders in the water column in a Kalman Filter to estimate the ocean currents acting on the cable and improve the cable shape and touchdown computations. This is particularly helpful when ocean currents are not being measured or when the quality of the transponder position data is not very high. The Kalman filter outputs a current profile such that the difference between the measured and calculated (by the model) transponder positions is minimized. These currents can be used by the cable model to predict touchdown conditions in the near future and make corrections to the installation procedure to avoid undesirable touchdown conditions. The software can log ocean currents measured in real-time using an Acoustic Current Doppler Profiler (ADCP). The current data are filtered and used by the 3D cable model to provide the user with more accurate cable shape and touchdown conditions during the installation and retrieval operations. Depending on the type of array being installed, making use of real-time current measurements can improve the cable placement accuracy by a factor of 2 to 4. 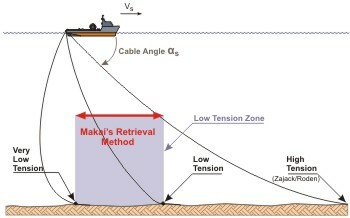 MakaiLay Seismic’s 3D cable model has been optimized for the retrieval of cables. 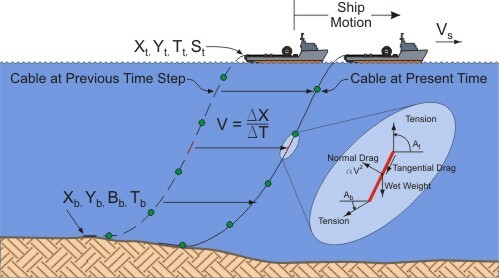 As a result, the software can now model more accurately the cable-seabed interactions and cable being dragged as a result of the seabed cable tension. Having an accurate knowledge of the cable conditions on the seabed at all times allows for cable retrieval with lower seabed tensions, which in turn decreases cable dragging on the seabed. 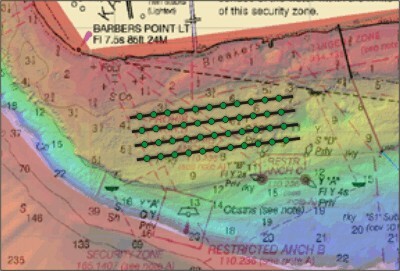 This helps minimize cable fouling with bottom outcrops and cable abrasion, thus providing longer array life. Historically, arrays have been retrieved with high tensions in order to prevent the array from looping back on itself or fouling with seafloor obstacles. However, high tensions have resulted in damage to the sensors and the array. Today, arrays are being retrieved at conservative speeds to minimize damage to the cable. Slower speeds result in longer retrieval operations and an increase in costs. MakaiLay Seismic provides cable engineers with real-time feedback of the cable touchdown and tension on the seafloor and on the effect of cross currents acting on the array. Therefore, the tension of the cable can be better controlled during the retrieval process maximizing cost savings while minimizing array damage. MakaiLay Seismic logs all data critical to the cable installation and can log any other available digital data as well. The software provides extensive documentation on the cable lay both in detailed data logs and in GIS as-laid databases. Data retrieval, display and compatibility with other software are very flexible. As-laid user-configured charts, tables, 3-D images and summaries can be retrieved at any time during the lay on either the main computer or on remote stations throughout the ship. The software distributes data as needed to client computers located anywhere on the ship.